After a short hop over from Seoul, I arrived at Osaka-Kansai airport after what was probably the bumpiest flight of my life. The airport itself is pretty cool; the entire airport is an artificial island in the middle of Osaka Bay. A delay meant that it was now around 9pm, which, given that my hostel was 100km from the airport, was an inconvenience to say the least. Not to worry though! Japan is famous for its superb rail system which would get me to Kyoto in no time, right? Wrong. Navigating Japanese trains can be tough. The system is very simple once you get the hang of it, but for a tired first-timer it can be confusing, and sure enough, I managed to turn a 1.5 hour journey into 4 hours by getting on the wrong train. I arrived at my hostel at midnight and decided to dump by bags and go for a quick explore. First impressions were good; the city is exactly what I had pictured Japan to be like; temples, narrow streets, and lots of old buildings in traditional Japanese style. My first, and only, full day in Kyoto. I knew I would be pressed for time so woke up very early despite the late night I had had. I planned an itinerary for the weekend which would fit in as much as possible, grabbed some of the breakfast, and headed out. First stop was Kinkaku-ji Temple, a Zen Buddhist temple constructed in 1397. The temple was stunning; a huge structure draped in gold sat in a lake, surrounded by forest. However, there was one problem; tourists. I am aware that complaining about tourists whilst being a tourist is a tad hypocritical, but the presence of large tour groups really did impact my experience of the temple. One would normally expect tranquillity and calm at a temple, but being surrounded by hundreds of people made this an impossibility. Next stop was Ginkaku-ji temple. This was far less touristy, with no large groups blocking paths, plus it had very pretty surroundings. From here I walked down the rather aptly named ‘philosopher's path’; a path by a canal with overhanging trees, peppered with temples and shrines. Over the next few hours I made my way along the path, stopping at Anrakuji temple, Eikan-do Zenrin-ji temple and Nanzen-ji temple. At this point it is worth mentioning costs. Most of these temples do have an entrance fee of around ¥500 (£3.50), which is reasonable, but given the number of temples there are to visit, it does add up. However, most shrines tend to be free, and there are several free temples to visit to along philosopher’s path. 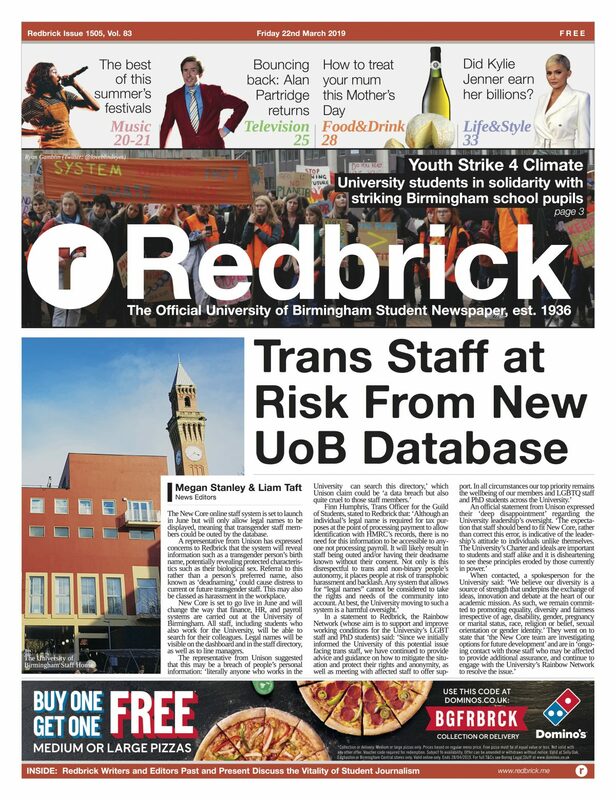 Transport costs depend largely on the individual; busses are reasonably priced, but trains are somewhat expensive. Kyoto is a fairly walkable city, so I would recommend walking between sights, especially along the east side of the city. I would recommend purchasing a bus day ticket for ¥600 (£4) and using a combination of buses and walking to get around the city. This is probably the cheapest and most efficient method of navigating Kyoto. The final stop for the day was visiting the Gion district at night. Here I visited Yasaka temple, which looks especially good at night as the red paint and ambient glow of the lanterns contrasts nicely with the night sky. Today I would be meeting a friend in Osaka - a 30 minute train ride from Kyoto, costing around ¥550 (£3.80) each way. By 10am I was at Umeda station in Osaka. After finding my friend, we went to Osaka castle. This is a very large castle/temple surrounded by a moat, which is surrounded by a park, right in the centre of the city. The castle itself is very strange. We went in expecting old decorations but were very surprised to find that the inside had been entirely refurbished into a museum – using a lift in building from the 1500s was an odd experience (I later discovered that it was renovated in 1995). 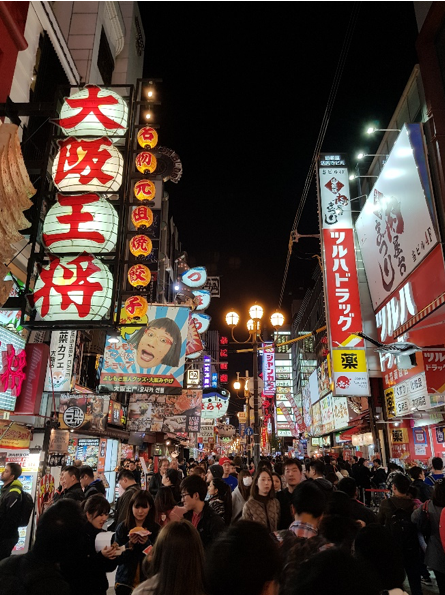 Next stop was Dotonbori, the famous street food district, particularly known for kushikatsu (various battered and deep-fried items), okonomiyaki (Japanese pancake) and takoyaki (battered octopus). Being spoilt for choice meant that I could not eat all of these, however, I did try takoyaki, BBQ crab claws, and ramen. Although the food was not particularly cheap, it was delicious. An added bonus was that at night the area is buzzing with the organised chaos that can be found across Japan. Overall, Osaka is worth visiting if in the area, however, I would recommend prioritising Kyoto. After an early start, I headed to Arashiyama, an area in the North west of Kyoto famous for its bamboo forest, around a 20 minute train ride from Kyoto station. Similar to Kinkaku-ji on the second day, it was a beautiful place that was somewhat ruined by the presence of many tourists and large groups. I stopped at a convenience store called Lawson, to try what I had read is one of the best egg mayo sandwiches in the world, and sure enough it was pretty tasty. 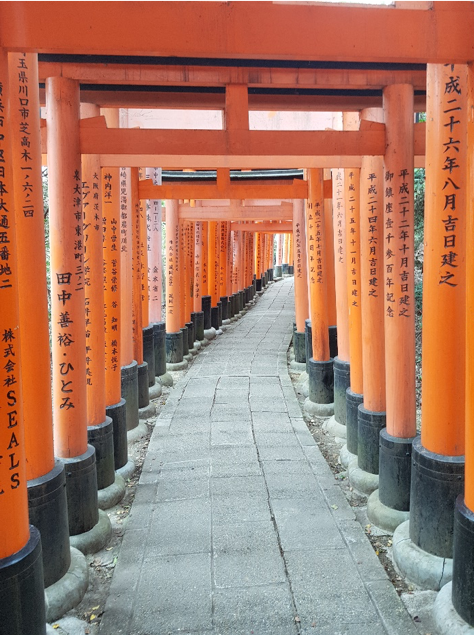 After exploring the bamboo forest and Tenryu-ji temple, I headed back into Kyoto to make my way towards Fushimi-Inari. This is a massive shrine containing around 32,000 sub-shrines. After some exploration I found some sections which were completely empty, although this did require a 40 minute mini-hike up Mt. Inari, but it was well worth it. This was the final stop on my trip, as I soon headed back to Kansai Airport to catch my flight home. 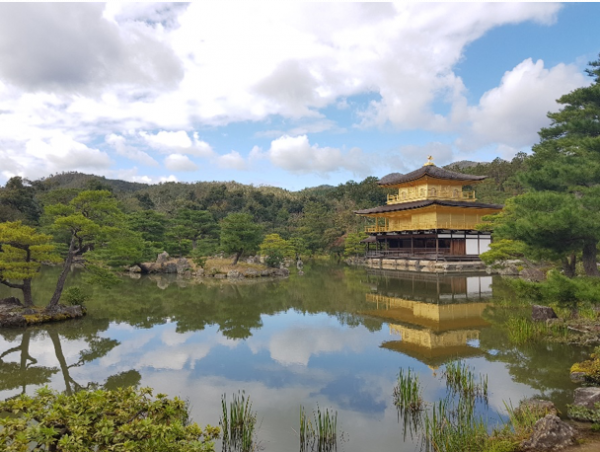 Overall, Kyoto is well worth a visit, although I would recommend avoiding Spring and Autumn, as it can get uncomfortably busy during these periods. Osaka is also worth a visit, although I would recommend prioritising Kyoto.